I'm at a loss for words. I am here, sitting in bed and I have no clue what to write. This book blew my mind. After reading Remember Remember by Sue Whitaker, I knew that I could expect a brilliant story but I was not expecting that. At all. That was magnificent. It was perfection. Two people with death sentences hanging over them, one due to illness, the other due to injustice, meet through the medium of letters. They build an unlikely alliance each coming to depend on these letters and each other. But one day the inevitable will happen and the letters will stop and what then? I loved this book from start to finish (if that's not already obvious) and I thought that the storyline was breathtaking. I really cannot talk about this book too much because of spoilers but it's about a woman who suffers from pancreatic cancer and she writes to 'anyone' who is on Death Row awaiting his dreaded date. The emotion that Whitaker creates is extraordinary; I think I was crying at nearly every single page because how the characters described what they were going through was so real. "Have you ever stared at something until it goes blurry, and carried on staring at it until it disappeared completely? That is what seems to have happened with my whole life." - Sue Whitaker, Dear Anyone Dear Anyone is written in such a beautiful way that tugs fiercely at every single one of your heart strings and then after it's done with the tugging, it rips them out completely so that you're left in a huge messy pile on your floor. After finishing this book, I just stared at my laptop screen, not quite sure what to think other than "wow". I didn't know what else to think about other than the amazing writing that I had just read and how I felt like I was the one receiving the letters off of the characters. It felt all too real. My review doesn't even do this book justice. You need to go and get it and you can buy it from the ETA website for such a good price! PLEASE PLEASE PLEASE GO AND READ IT! Three Point Five Stars Dear Anyone is a story written in the form of letters between Ava Cunningham, a woman with pancreatic cancer who lives in Swanage in England and a prisoner in the Florida state prison. They are both suffering for very different reasons and find comfort in reaching out and bearing their souls to a complete stranger rather than those closer to home. Throughout their correspondence their friendship grows ending in them finally meeting and getting a happy ever after ending. I would have liked to see a wider difference in the writing styles of both characters for this book to work better for me, the prisoner was surprisingly very eloquent for one whose earlier life lacked much education. This book is written beautifully and really has you gripped from page to page. 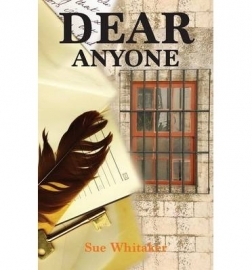 The author, Sue Whitaker, has a real talent with her writing and it really pulls you in and sets the scene around you, as if you were in the book too. A real ride of emotions between two people who you wouldn’t expect. It’s hard to write a review without spoiling the book. When I say you will not want to put it down I mean it, it tugs on the heartstrings and takes you along with it. I loved this book from start to finish, every page had me feeling a different emotion, that’s when you know it’s a great book. I would recommend this book to everyone looking for a fantastic read that will tug on your heartstrings and give you goosebumps. It’s an amazing book that I will continue to read again and again.